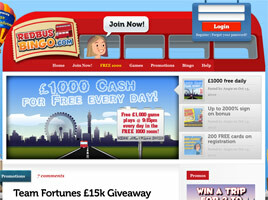 Booking a passage to profits at RedBus Bingo is as easy as signing up. Each newly registered player gets a free scratchcard just as soon an initial deposit of £5 to £100 has been made. Every card provides a lucky bonus, with the big prize being an incredible 2,000% match of the first deposit amount up to £2,000. The minimum prize amount is £5. Graphically patterned after London’s iconic double deckers, the online bingo room known as RedBus Bingo is a collaboration of Belize-based Daub Limited and 888 Holdings of Gibraltar. Soon after its embarkation in April 2010, the web site soon began catching eyes as the sponsor of a popular ITV quiz show, All Star Family Fortunes 2010. The “bus” is powered by a compendium of gaming applications from Cassava, CryptoLogic, Eyecon, OpenBet, PartyGaming, and WagerWorks. English is preferred language on RedBus Bingo, and its fares are denominated in British pounds. There is no download required to wager and play. If RedBus Bingo had a High Street, it would be its 90 Ball Bingo, the traditional game with prizes for the first to complete one line, two lines or a full house before the other players in the room. As an alternative route, there is 75 Ball Bingo, conducted just as it is favoured in the USA and Canada. Starting at £150, the site’s landmark 75-ball Progressive Jackpot can be won by getting a bingo on the special London Eye pattern (which is 16 slots to daub) in 45 calls or less. The 90-ball Progressive Jackpot gets rolling from £100 and doesn’t stop until a full card is covered in 37 calls or less. Adding to the cheery scenery at RedBus Bingo are lots of Instant Win games, from innovations like Bee Happy and QuickFire Lotto to the classics—Arcade Horses, HiLo, and Scratchcards. Four casino games and seven slots help pass the time between bingo stops, and five Progressive Jackpot Slot promise huge rewards to whoever can make the grade first. As well as the initial player promotions another popular attraction at RedBus Bingo is the “200 Free Cards” given to all new passengers who board RedBus. It amounts to £2 in Bonus Funds credited automatically to each player’s account upon registration. The funds can then be used to purchase up to 200 1p bingo cards. No matter how much is won with the free scratchcard or using the 200 free cards, nothing beats playing for free and getting awarded real cash for winning. That’s the concept behind RedBus Bingo’s £1,000 free bingo game daily. Known as “Ride Free 1000,” this game gets under way at 9:15pm each evening. And there are more free games, too, all listed under the Free Zone tab of the web site. Departures take place between 8am and 1am every single day, seven days a week. As the “mileage” put in at RedBus Bingo accumulates, so do the Bonus Points. These are the site’s way of rewarding loyal customers, with no less than one point received for every 5p card purchased. When 1,000 Bonus Points have been earned, they can be redeemed for £1, which is added directly to the passenger’s account. Another way to pile up points is to refer friends—worth a full 15,000 of them for each new referral who signs up. Please not that a minimum deposit of £20 must be wagered on either bingo or instant games prior to the first withdrawal.